Xiaomi took the wraps off the Mi 8 along with a higher-placed Mi 8 Explorer Edition during the 8th anniversary celebrations in Shenzen, China. The Chinese tech giant also unveiled a mid-range offering Mi 8 SE along with its new flagship offering. The Xiaomi Mi 8 comes equipped with Qualcomm Snapdragon 845, a dual camera setup with AI capabilities and dual-frequency GPS. Coming to the Mi 8 Explorer Edition, Xiaomi has added an under-display fingerprint scanner to the spec list. 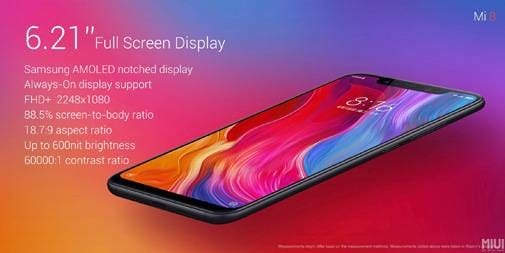 Meanwhile, the Xiaomi Mi 8 SE is the first device to sport a Qualcomm Snapdragon 710 chipset. Xiaomi has also incorporated the notch with its new line up of Mi smartphones. All three devices have a display cutout at the top which takes the screen aspect ratio to 18.7:9. While the display cut-out on The Mi 8 and Mi Explorer Edition is broader than what we have seen on Android devices, the extra space has been used to house the required sensors for infrared face recognition. As expected, the Xiaomi Mi 8 is powered by a Qualcomm Snapdragon 845 clocked at 2.8GHz with Adreno 630 GPU clocked at 710MHz. This is coupled with 6GB of RAM and either 64GB, 128GB or 256GB of storage. 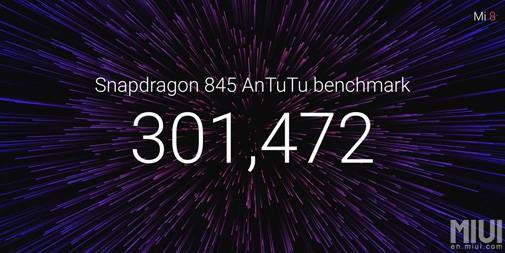 The new Xiaomi flagship has posted a score of 301,472 on Antutu benchmark, which is indicative of the most powerful smartphone to come from a Chinese manufacturer. Up front, the Xiaomi Mi 8 sports a 6.21 inch screen with a notch at the top. It is an AMOLED panel with a FullHD+ resolution (2248x1080 pixels) and captures 88.5 per cent of the front of the device. The device draws juice from a 3,400mAh battery with support for QuickCharge 4.0+ fast charge protocol. The device has a USB Type-C port and no 3.5mm audio jack. 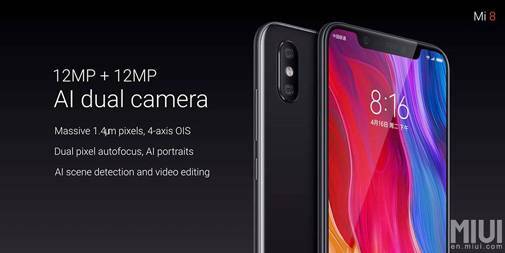 In the optics department, the Xiaomi Mi 8 boasts a dual camera setup with a 12MP wide angle lens and a 12MP telephoto lens. The wide angle lens also comes with optical image stabilisation and an aperture of f/1.9, whereas the telephoto lens has an aperture of f/2.4. The front camera is a 20MP sensor with an aperture of f/2.0. The main camera on Mi 8 allows for video recording in 4K, 1080p and 720p at 30fps. There is an option to capture slow motion videos in 720p at 240fps, or in 1080p at 240fps and 120fps. 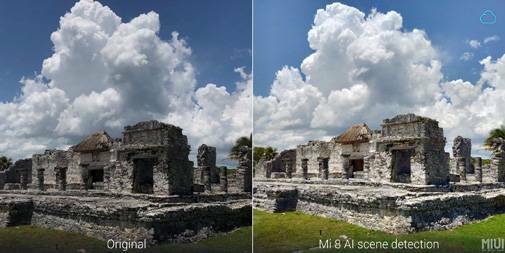 The camera on Xiaomi Mi 8 posted an overall score of 99 and photo score of 105 on DxOMark, a fact that was prominently mentioned during the launch event. 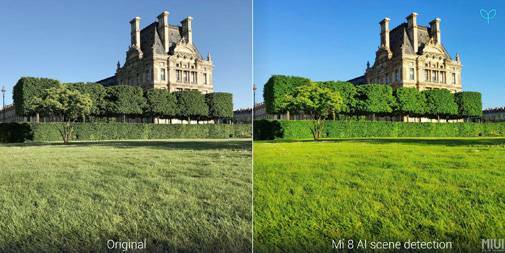 The Mi 8 exceeds the iPhone X in both fields. During the launch event, Xiaomi said that it is trying to offer better imaging capabilities than the leaders in the segment like Apple and Huawei. 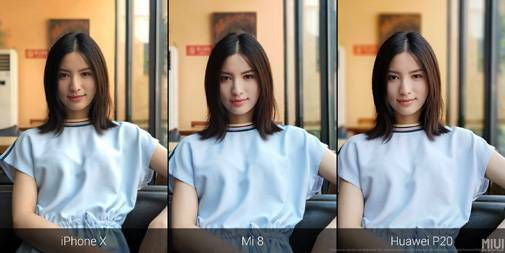 Xiaomi also claims to have gone big on artificial intelligence with the camera on Mi 8, adjusting light settings according to the subject that is being photographed with AI scene identification. 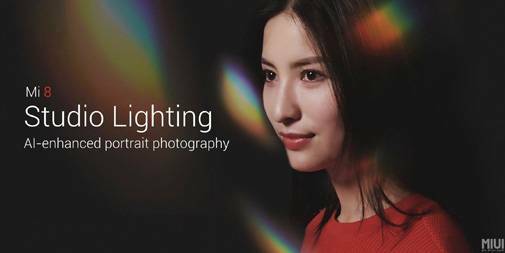 A new Studio Lighting Mode has also been introduced with the device which works similar to the portrait lighting mode seen on Apple iPhone X and iPhone 8 Plus. 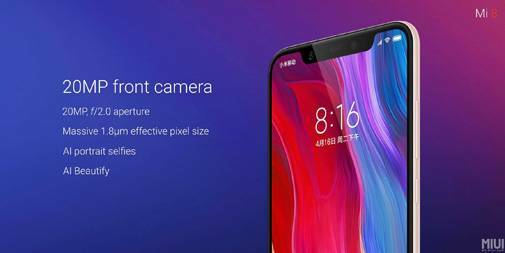 The Xiaomi Mi 8 also is the first device in Android ecosystem to bring hardware-powered facial recognition. 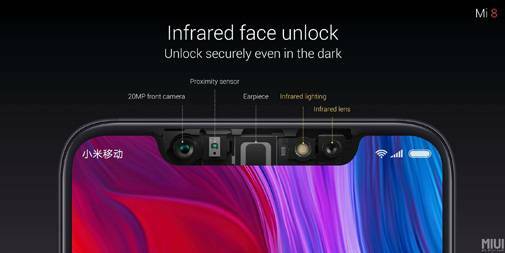 The new Xiaomi offering uses an infrared light and an infrared sensor, placed in the notch, to scan faces and can even work in dark environments. Another feature of the Xiaomi Mi 8 is dual-band GPS, which allows it to receive L1 and L5 signals simultaneously. This new feature eliminates interference from buildings and reduces signal delays which increase the accuracy of navigation. The Xiaomi Mi 8 features the Qualcomm Snapdragon 845, similar to the Mi 8, but will be available only with 8GB RAM and 128GB internal storage. The biggest difference between the two devices is the under-screen fingerprint scanner available with Mi 8 Explorer Edition. The area covered by the fingerprint sensor on Mi 8 Explorer Edition is similar to the conventional one placed at the back of Mi 8. The Mi 8 Explorer Edition also features a transparent back, unlike the Mi 8. The Mi 8 comes with a price tag of CNY 2,699 (around $420 or Rs 28,000) for the 64GB storage variant, the 128GB variant has been priced at CNY 2,999 (around $460 or Rs 31,000), and the 256GB variant has been priced at CNY 3,299 (around $515 or Rs 34,700). The Mi 8 Explorer Edition has been priced at CNY 3.799 ($577 or Rs 38,900). The Xiaomi Mi 8 SE has been priced at CNY 1,799 ($280 or Rs 18,900) for the 4GB RAM variant and CNY 1,999 ($312 or Rs 21,000) for the 6GB RAM variant. Availability details for Chinese and global markets are expected to be released in coming weeks.